Dr. Mann goes to Disneyland | Watts Up With That? 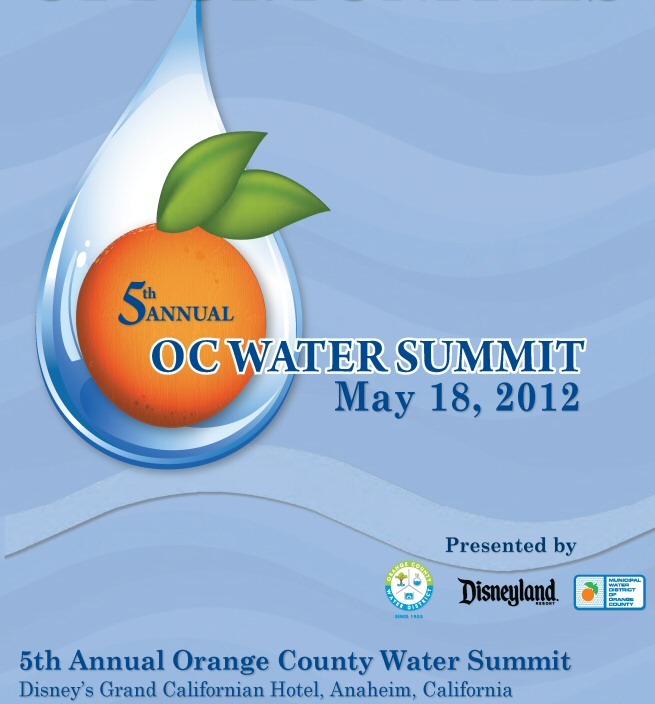 It seems Dr. Michael Mann has been invited to speak at a water conference. I’m wondering if his buddy, Dr. Peter Gleick was invited or not. Climate Change: Is it real or BALDERDASH? But that isn’t the most interesting part, how Dr. Mann is described is. Given the way he is described in the program, you’d think he and Al Gore and all the members of the IPCC that shared the Nobel Prize didn’t exist at all. Here’s an exchange between the IPCC and CCNY professor Themis Lazardidis as reported in the Greek University Reform Forum. Thank you for your response. I was referring to news reports in greek media, e.g. Are you saying that the above is false? About 2000 personalized copies of the 2007 Nobel Peace Prize together with a letter of Dr R.K. Pachauri have been sent worldwide to Coordinating Lead Authors, Lead Authors, Review Editors, Bureau members, staff of Technical Support Units and of the Secretariat, who have contributed substantially to the work of the IPCC of the last 20 years. So Mann’s claim is false/wrong. He should only claim to have received a certificate of involvement (see below) in the IPCC. Above: Dr. Mann’s actual certificate. The question today: will Dr. Mann come away from Disneyland thinking it is the “happiest place on Earth”? Stay tuned. Those by proxy records have such huge error bars. Shouldn’t that be ‘the Hippiest Place on Earth’ when this conference is in town? Congratulations to Steve McIntyre (IPCC reviewer) and Michael Mann (science pervert and author of the widely replicated though discredited “Hockey Stick” graph) on the occasion of their receiving the Nobel Peace Prize. 7And he put forth a parable to those which were bidden, when he marked how they chose out the chief rooms; saying unto them, 8When thou art bidden of any man to a wedding, sit not down in the highest room; lest a more honourable man than thou be bidden of him; 9And he that bade thee and him come and say to thee, Give this man place; and thou begin with shame to take the lowest room. 10But when thou art bidden, go and sit down in the lowest room; that when he that bade thee cometh, he may say unto thee, Friend, go up higher: then shalt thou have worship in the presence of them that sit at meat with thee. 11For whosoever exalteth himself shall be abased; and he that humbleth himself shall be exalted. 10,000+ winners? Talk about diluting the significance. Didn’t Time Magazine give “The People” the Person of the Year Award a couple of years back? Why doesn’t Mann list that, too? If you robbed a bank, would you care about driving off without a licence? If you’re 1M$ in debt, do you care about overspending another $1K? Now I wonder if those individuals who keep alleging that Lord Monckton isn’t a member of the House of Lords will challenge Mann’s claim to being a Nobel Peace Prize winner. I’m not holding my breath. Titles, Titles, Titles. CAGW propoonents question Monckton’s right to be called a Lord. We question Dr. Mann’s right to be called a Nobel Peace Prize winner. Titles are skin deep. Whether or not Monckton is a Lord, he is articulate and knowledgable about “Global Warming.” Whether or not Dr. Mann won the Nobel Peace Prize, he is the south end of a north bound horse. When Obama gets a Nobel Peace Prize for doing… well… absolutely nothing, I’m more than willing to let Mann slide on this issue. The peace prize nowadays is akin to receiving the coveted “Participant” in school endeavors. If someone is impressed by it then they need to get their head examined. Dr. Mann’s Nobel Prize reminds me of the opening scene of The 14-Carat Roadster. So, essentially a Nobel Peace Prize means nothing. Q Whats the difference between Mann and Micky Mouse on a bad acid trip . A Micky still makes some sense. Monkton’s Grandfather earned the title of Viscount and the right to call himself a Lord. Denying Monkton the title is a direct insult to his grandfather’s accomplishments. The “House of Lords” thing is a technicality, where hereditary nobility had their voting rights removed, but were not technically removed from the House. Either way, he stil holds the position of Viscount, and the proper mode of address is “Lord”. That title is a family heirloom, and it is his right to claim it. Mann did not earn a Nobel prize. He participated in a group that won the prize. Probably the best phrasing he can use was that he was a lead author with the “Nobel Prize winning IPCC”. This is completely different. When Arafat won The Nobel PP, I wondered about it. When Algore won it, I realized it was a political thing. When Dear Leader, won it, that sealed the deal. For obvious reasons, beyond the problem with the science, I have no sympathy for Michael Mann. However, it is ironic that he is now the victim of misrepresentation by people promoting (hyping) his appearance at their event. Most of the accusations of falsifying my credentials came from similar incorrect and overhyped statements in conference promotions. One example, was the length of time I taught at the University of Winnipeg. The false statements received particular focus through the Wikipedia item on me reportedly produced by William Connelly. I had not intended to have a web page, because they are a monster that needs constant feeding, but set one up primarily to set the record straight. Mark Twain said “A lie can travel halfway around the world while the truth is putting on its shoes.” Now, with the internet, it is around the world hundreds of times before you even find the shoes. Interestingly, the remark is only attributed to Twain. The good news is the truth can travel as fast, if you make the effort. You all are being mean to Dr. Mann. Next you’re going to claim he didn’t win an Oscar. (/sarc, in case you need it). Seems fitting that Mann’s attendence will be sponsored by Goofy. As we’ve all be saying, his work is pretty Mickey Mouse. PS> And if it “pays”, so much the better! If Dr Mann truly won the Nobel Peace Prize then I’m sure he will be happy to wear his medal at this event so we can all admire it. Strange, though, that I have not been able to track down any extant photos of him doing so so far. And well-founded rumour has it that he is not overinclined to hide his light under a falsely modest bushel. One might imagine that he would not have been shy of displaying his achievement – should he indeed be in possession of it. Or perhaps not. Funny old game climatology…nothing is ever what it seems……….one always always always has to check everything a climatologist claims. There just occasionally might be some truth buried there and one wouldn’t wish to overlook such a rare occurrence. The Nobel Peace prize is usually awarded to the Crack Pot of the year. The sum of the information is the square root of the number of contributors. All these scientists are referred to as Nobel Price winners in the press; that was the entire purpose of the price – aggrandizing the now contradicted CO2+water vapor AGW theory. Just like all the writeups that ignore the disproved positive water vapor feedback conjecture, it’s invalid and its main purpose is to boost the failing green energy + tax scam. Why don’t you send Mann to Europe, that’s the continent that he helped mess up the most. Our green fanatics will kiss his feet; at least the few of them that ever heard the name. I honestly don’t know if Mann is a liar and a crook who’s attempting to keep his gravy train rolling or…clinically insane. Intergovernmental Panel on Climate Change (IPCC) , Albert Arnold (Al) Gore Jr. They are careful to distinguish individuals and organizations, so neither Mann nor Pachauri won the Nobel Peace Prize, even if Pachauri does have the medal. Is he part Cherokee too ? Everywhere one looks one finds people with questionable credentials in places of which they are proud. Steve McIntyre contributed to the IPCC documents (albeit, critically). So he’s a Nobel winner too? To think the Nobel Peace Prize meant something once. Anybody remember Jubal Harshaw in ‘Stranger in a Strange Land’? Something about being to proud to use the title “Dr.” once they started handing it out to playground supervisors. At this point, I wonder if some scientists wouldn’t feel a similar shame, earning this ‘distinction’. Who the hell is lying here? 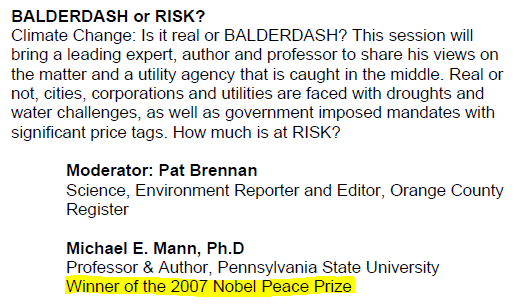 “BALDERDASH or RISK?” With Mann, they are sure to get a heaping helping of balderdash about the “risks of climate change”. I think the Nobel Peace Prize is awarded to anybody who was unable to get dynamite to explode; thereby ensuring peace in the neighborhood. Their justification reads like a carnival sideshow barker’s pitch of overstatement of the unusual and scary. Has anyone checked Nobel’s grave for unusual noises such as gnashing of teeth? As far as I can see, if Green Peace is so often referred to as Green Piss – tell me again what the Nobel prize was he ‘won’? he should be very comfortable at disney. it’s his spiritual home as well as philosophical fountainhead of the post modernists. they all share a philosophy founded on disney’s first law, the axiom that ‘wishing makes it so’. as for the nobel prizes – gore got one for being the pitchman; obama got one on spec for his anticipated role as closer. it was all about cap and trade and inserting a drain into the main vein of the west’s used.to.be most powerful economy. doesn’t hurt to remember this is not about science. nobody proposes burning your house or tattooing you as a heretic over any scientific issue. I’m willing to cut MM a little slack on this one as I’ve used the same dodge myself at times. Back in the 70s I was a member of an organization that won the NPP as a whole. I used to occasionally drop my NPP winner status in at the bottom of my resumes, just as a check to see if anyone was actually reading them. I can’t recall anyone ever noticing of if they did they never saw fit to mention it. Simple logic suggests to me that if they award the NPP to an entire organization, anyone who was actively involved with that organization at the time has some claim on the prize, but it wouldn’t be something I’d be leading off with. The sentence could end there and all would be well with the world. 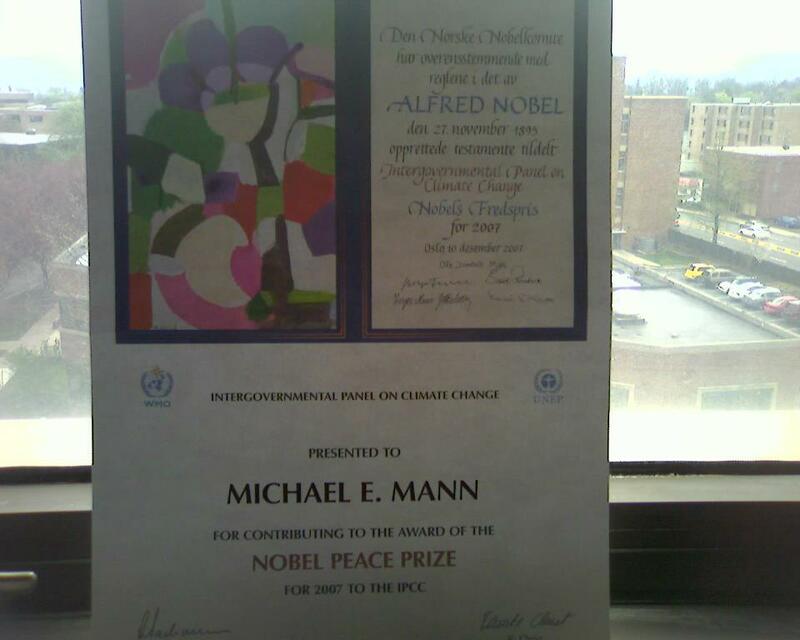 As for anyone with a connection to the IPCC’s Peace Prize, I believe Mr Mann has done more to indirectly cause social and political conflict and waste than any single individual in more than a decade. I include in that comparison the vast cost of Rumsfeld’s War in Iraq which is still cheaper than the misspending of a trillion+ $ on climate change issues’ and the economic opportunity cost of having done so. It is not just the wasted money trading carbon for silly ventures, it is what could and should have been done with that money to develop and render the world a more harmonious and safer place. The negative consequences in the years to come that have yet to arise as a result of the faked Hockey Stick temperature chart come because it was misused as definitive proof that mankind’s emissions of CO2 were causing a rapid, harmful temperature rise on a planetary scale. He is party to the original incompetence, and the very author of the cover-ups, misdirections and obfuscations that followed. That humanity will continue to suffer to the tune of hundreds of billions upon hundreds of billions of misspent Dollars to ‘correct’ this non-existent threat is undeniable and can be traced not to the arm-waving of the perpetually wrong Hanson and his ilk, but to the manipulation of tree ring data using defective and cherry-picking methods to create a historical temperature chart that would ‘remove the Medieval Warm Period’ (as he stated was necessary in 1995) all the while preserving the pretense of scholarship. 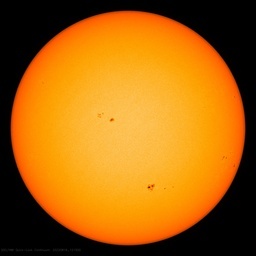 That pretense was maintained by a helping handful of influential formerly-credible scientists who abused the public trust and supported, with no evidence whatsoever (let him who believes otherwise produce it) with the avowed intention to move the whole of society away from an investigation of what warms or cools the Earth to a discussion only of ‘what to do about it’. There is always a large variability in the sea ice numbers. DMI uses a 30% cutoff on their graphic, most of the rest use a 15% cutoff. CT has for at least a couple years been an outlier on the low side being at times as much as a million km2 lower than the others, which is odd because a while back they extended their baseline to 2008 which made it lower than most of the others. From what I’ve observed of MM I doubt he would ever embrace a characterization of himself which involved him being part of anything as mundane as “The People”. He clearly sees himself as far superior to all of us poor schleps out here in flyover land who are too ignorant to appreciate his brilliance. Wow, I wish I would have known about this a day or so ago. I would have went, it’s not far from where I live. The new “Nobel Prize” for “all & sundry” denigrates the institution, and we can all clearly see that awards made in the so called “peace prize” are of course the sole province of the Norwegian Nobel committee. All the other prizes are awarded by the Swedish committee. Why did Nobel stipulate that? Norway uses the so called peace prize as an instrument of annoyance to its neighbour. bear that in mind when juding recipients of the so called “peace prize”. It would have been more significant if Gore or Pachauri or any of the others had been awarded a prize within the grant of the Swedish Nobel committee. That didn’t happen though, and significantly many Swedish awarded laureates are onb the side of the army of light and truth. I have to say that there appears to be more than a whiff of self-aggrandisement among the main AGW activists. This present instance aside, we had Mann and Jones’ Emails in Climategate 1, arranging preferment into a US learned scientific body – AGU/APU? We have Gleick, MacArthur “Genius” (made me chuckle under the circumstances I first heard of it). We have Sir Paul Nurse, Nobel Prize (for his work in genetics), who suddenly found himself able to dispense scientific ‘expertise’ on climate, a subject on which he clearly knows next to nothing. Come the day, if Steve McIntyre merits recognition for all his sterling work against the odds, I would sooner he received a knighthood in the Queen’s Birthday Honours list – not the New Year’s list (which is tainted by UK Party politics) – because, as a Canadian, he’s eligible. This would be even more satisfactory if HM delegated Charlie to award the honour – the teeth-gnashing would be audible in Toronto! PWalker I don’t know who you are but I love you and your humour. I’m still laughing five minutes later. If only Mann also came from a persecuted religious minority and had a limp he would be perfectly “rounded”. I am delighted to advise that the results of your DNA tests are to to hand and the scientific algorithms involved predict that you are a direct descendant of the late Sir Isaac Newton. Alas confidentially on the wrong side of the blanket as it were but no matter as you are in fine company. Who knows we may even be related as my farming forebears were prolific seed sowers. My Swedish friend Gustav has phoned with the explosive news that a certain committee (!) will be amending the citation to Big Al. In the near future therefore at functions you will be entitled to, in addition to the Lord part, add NPP(almost) to you list of qualifications. Etiquette demands that it is given precedence over a mere PhD, BSc. and the like. Should he not fall on his sword as Scott Thompson has? In reality, Thompson will depart thanks mostly to the reveal earlier this month that he did not have a computer science degree from Stonehill College, as his official bio at both Yahoo and previously at PayPal claimed. Thompson’s false computer science degree was also listed as part of Yahoo’s regulatory filings. Funny that the Nobel Peace Prize was named after Alfred Nobel, the inventor of dynamite. Nobel Peace Prize?? (haha)^50. Obviously it was an adapted climate model that spit that out. Trenberth is falsely claiming a prize on his CV that he has not received. This is inexcusable and is perhaps a sign of his true character.Yes you can ask Chris Landsea how he feels about him. Kevin Trenberth has a 46 page CV . He lists himself as a Distinguished Senior Scientist, really now! I call that a big head. Now I know academics like to pad their CVs with all sorts of trifling activities, but Trenberth’s goes way beyond the normal CV. That he is listed in Who’s Who in America (etc) – not something one should boast about: either you’re listed or not. A list of awards including: being a recipient of a number of research grants, the big con! (so what? – anyone who has a job is getting paid), Being a member of some societies. Delivering an annual lecture at the University of Minnesota in 1998 and other such lectures, so what? My dad have given 5,000 lectures (Not on his CV) “Winning the Nobel Peace Prize” With the IPCC in 2007 (Maybe Al Gore can claim to have won the prize, but it was given to the IPCC not to Kevin Trenberth – if you search for a Nobel laureates on the official Nobel website, Trenberth’s name or Mann’s does not appear (Gore does. Then pages upon pages of being on panels, workshops bla, bla,bla. Like Mann; Trenberth is self obsessed. Look! Monckton corrected a table that went into the IPCC report. Therefore he probably has as much claim to a `Nobel Peace Prize’ as this Trenberth and Mann have He as clearly being sarcastic , but it did not stop the smear campaign from the warmists. Mann and Trenberth are lying. The IPCC won it. No one else can make that claim. What is it about the IPCC that people such as Trenberth , Mann think they can make a claim to have received the Nobel Peace Prize? As far as I can ascertain no one who works at the RedCross, or UNICEF or other organizations make such an outrageous claim. “What they have done is no better – perhaps worse; than those who buy a PhD or other degrees to make their CVs seem more salable. In my opinion, they should be dismissed from their positions for unethical behavior.” Yes? Pardon my ignorance but, do climate scientists only get “peace” prizes? Shouldn’t “climate scientists” receive Noble Prizes for, oh, I don’t know, maybe “SCIENCE”? It seems to me Dr. Mann redefined historical temperatures and has corrected a long misconception of earth’s temps by removing the erroneous LIA & MWP. This “scientist” deserves the Noble Prize for his work and not some silly “peace prize”..
Why is this not the #1 propaganda point coming from the TEAM? Oh that’s right. I know why. In case no one else has observed, the “genuine” Nobel prizes are granted by a SWEDISH committee. Nobel PEACE prizes are granted by a committee of the NORWEGIAN parliament. Are they political? You be the judge. The Mann Peace Prize is as much a farce as is the hockey stick that made him the Mann his is today. Y’all are just jealous. Pardon me while I puff out my chest, dust off my lapels and polish up my resume’.